AFP Western Maryland is proud to offer one (1) scholarship of $1,000 for attendance at the annual AFP International Fundraising Conference to use toward registration, travel expenses, and accommodations. In order to qualify, applicants must not have previously attended the conference. Check back for 2020 AFP ICON Scholarship applications in summer 2019! The Chamberlain Scholarship program honors Ralph E. Chamberlain, CFRE. Mr. Chamberlain had a long and distinguished career of service to the Association of Fundraising Professionals (AFP), beginning in the 1960s when the organization was formed as the National Society of Fund Raisers (NSFR), through the late 1970s when the name was changed to the National Society of Fund Raising Executives (NSFRE), and until his death in 1999. Mr. Chamberlain’s dedication to the organization we now know as AFP never faltered in his long volunteer career with the Association. Because of his long-time support of the Foundation’s annual fund and generous planned gift, the AFP Board of Directors renamed their Conference Scholar Program in 2000 to honor Mr. Chamberlain’s memory and commitment to the Association. In order to qualify, applicants must not have previously attended the conference. AFP Western Maryland Chapter will offer one (1) scholarship that will cover the cost of registration for the recipient to attend the 2019 AFP ICON in San Antonio, TX. 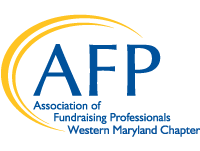 As part of the AFP Western Maryland's commitment to providing educational opportunities to its membership, annual membership scholarships will be provided for those who might not otherwise be able to obtain an AFP membership. Only one individual from any local organization or institution may be selected. Check back for Membership Scholarship applications in summer 2019!